Dimitris Poupalos is a distinguished Greek photographer who has established a name for himself as a prolific corporate and commercial photographer, especially after being nominated for the Hasselblad Masters Award of Photography. Specializing in architecture and advertising photography, his portfolio is rife with pictures that have something to say, offering a different take on the workplace. Poupalos is a fine creator of images that tell stories; stories that are worth seeing which can be understood without words. Through his eyes, we enter a world of surprisingly glossy hospital rooms, industrial landscapes and furniture factories, where radiology equipment replaces designer furniture, stacks of shipping containers masquerade as buildings and bunkering stations assure their dominance over the natural landscape. 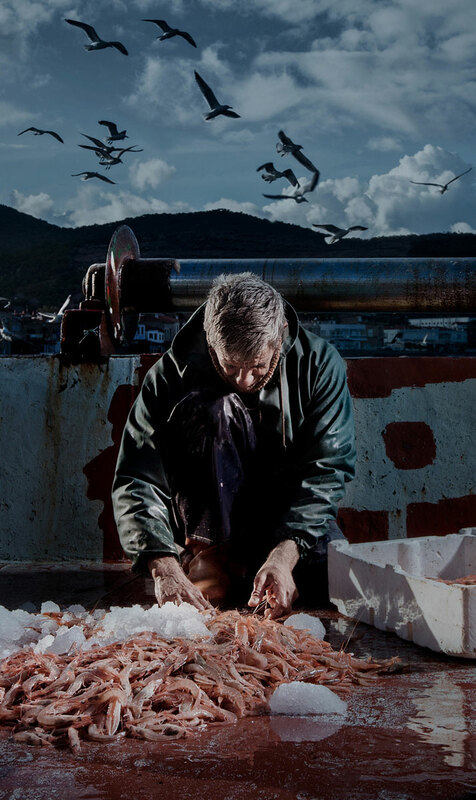 His latest project is called ‘Fishing in Turkey’ and features a series of pictures for a campaign commissioned bySquarefish, a Swiss frozen seafood company that specializes in wild Aegean shrimps as well as other natural seafood from the Mediterranean Sea. 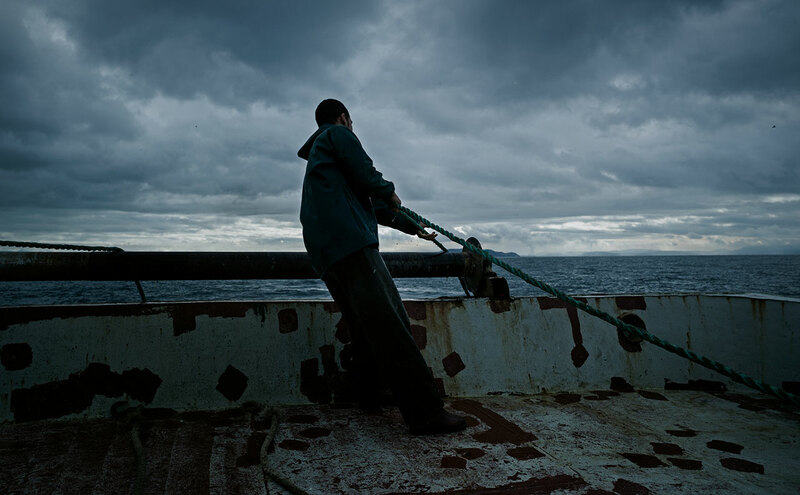 Shot in Izmir, Turkey, towards the end of 2012, the project sets out to tell the story of the Aegean Sea and its fishermen, transporting us on a journey through the world of commercial fishing. 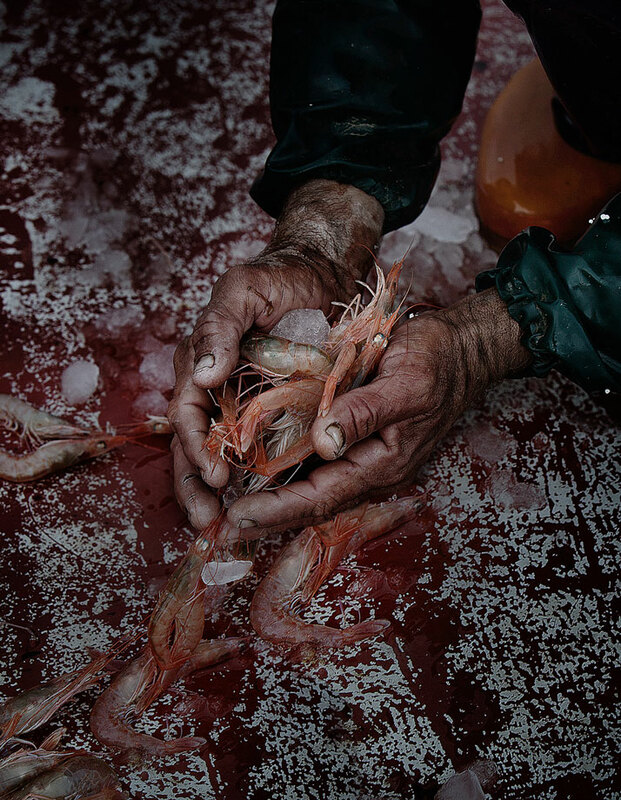 Poupalos and his lens board a hulking fishing trawler as it navigates the commanding waves of the majestic Aegean Sea, capturing the day to day life of the fishermen in hauntingly beautiful detail. 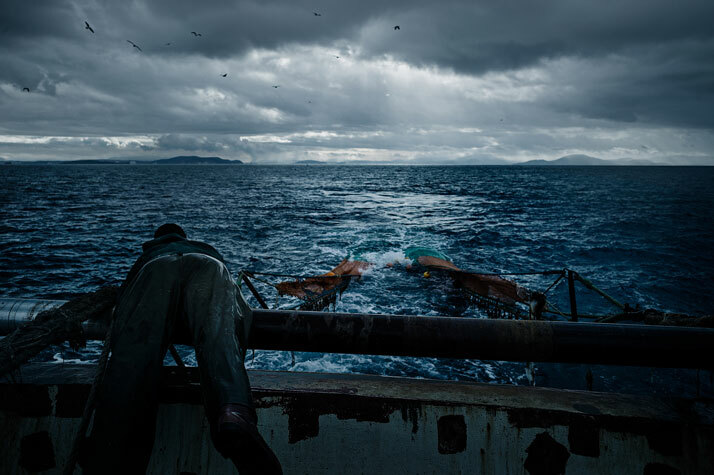 As opposed to acclaimed photographer and Alaskan commercial fisherman Corey Arnold, whose pictures skillfully chronicle commercial fishing and the tough lifestyle that accompanies it throughout the world, Poupalos opts to follow a different direction. 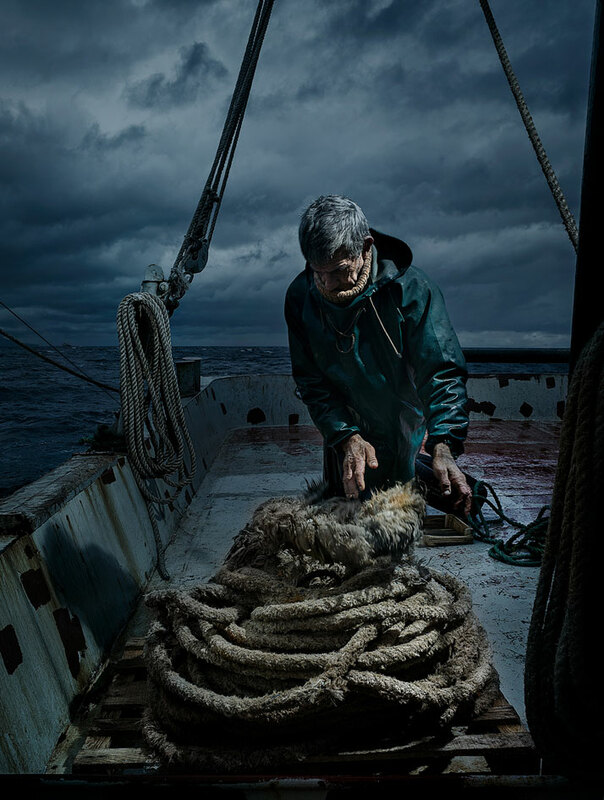 Although he documents fishermen in what is arguably a hard profession, his images emanate a sense of nostalgia amongst the big blue seas. Tempestuous yet strangely serene, intense yet calming, the landscape of the Aegean is transformed through his lens into a playing field that soulfully expresses saltwater symphonies and the fisherman’s blues. The almost cinematic frame and use of various layers of light is the main feature of his work. Looking at his pictures, we are immediately captivated by contrasting elements formulated by a highly expressive tonal scale that delicately alternates from the dark and obscured to the overtly lit. 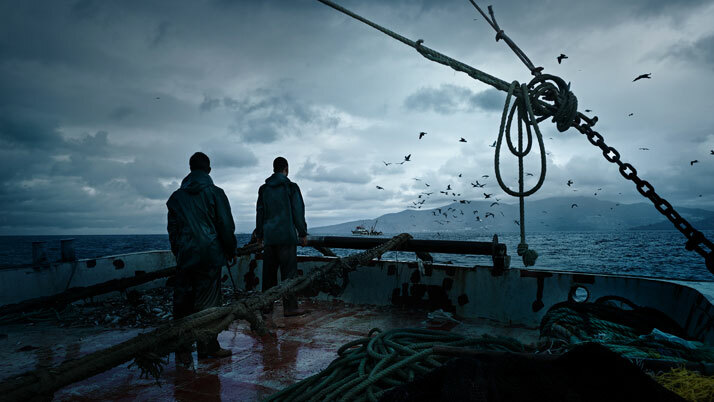 Following the fishermen on their quest for the freshest catch, we are immersed in myriads of shades of compelling blues and gloomy greys. Soft lights complement dramatic shadows in atmospheric scenes intensely rich with texture and detail. 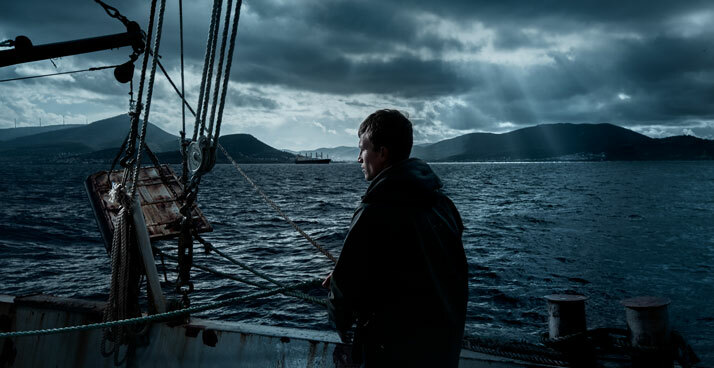 Combining natural light with added artificial lighting, Poupalosselectively highlights and focuses on details, bringing them to the fore, while leaving the rest of the scene to disappear into the shadows against a backdrop of distant horizons and heavy grey skies. 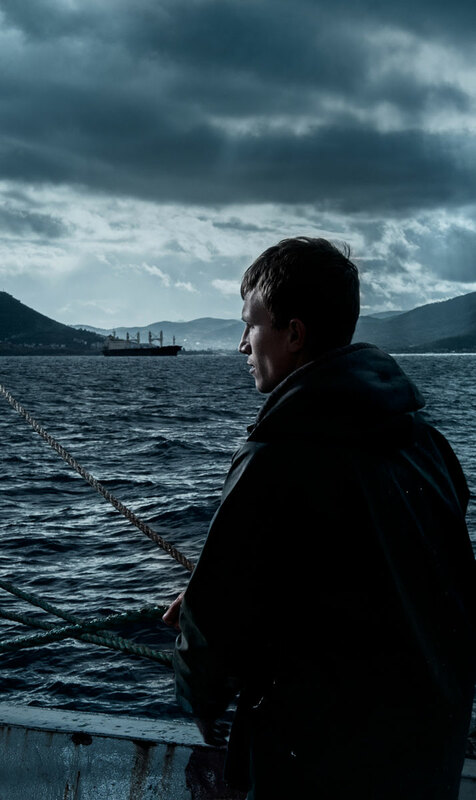 The unified ambience and constant action in the pictures account for a highly expressive cinematic charm, as if one is looking at stills from a film. There is a certain underlying narrative quality lingering as if we expect something to happen at any moment. 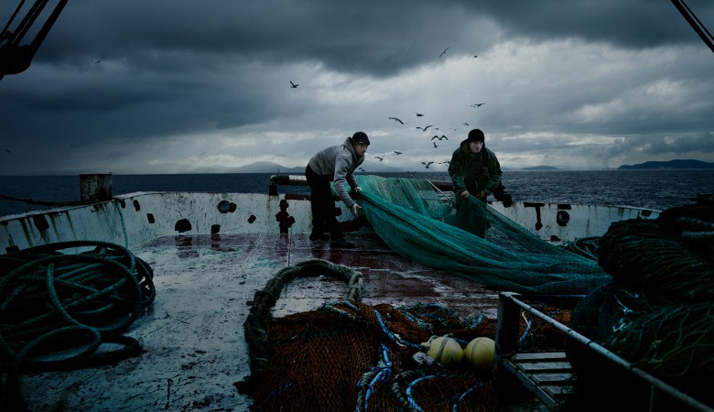 Close-ups of fishermen in action beautifully juxtapose and at the same time complement long shots of the distant horizon and the infinite sea. Looking at them as a whole, we can’t shake the feeling that there is a mysterious connection that pulls them all together, as if they were pieces of a life story, narrative instances that collectively make up a broader overarching storyline. Wet shiny surfaces, fishing nets and frayed hemp ropes make up for detailed narrative compositions that lead us to imagine all kinds of different subsequent scenarios and emerging plots. We can almost feel the wintry sea breeze and the salt in the air, we can almost hear the distinctive splashing of the waves echoing off the distant coastline. All the way from the first to the last net of the day, Dimitris Poupalos approaches the subject delicately and with great respect for the people who spend their lives taming the waves of the Aegean, beautifully telling the story of fishermen who know and respect the value of their catch. 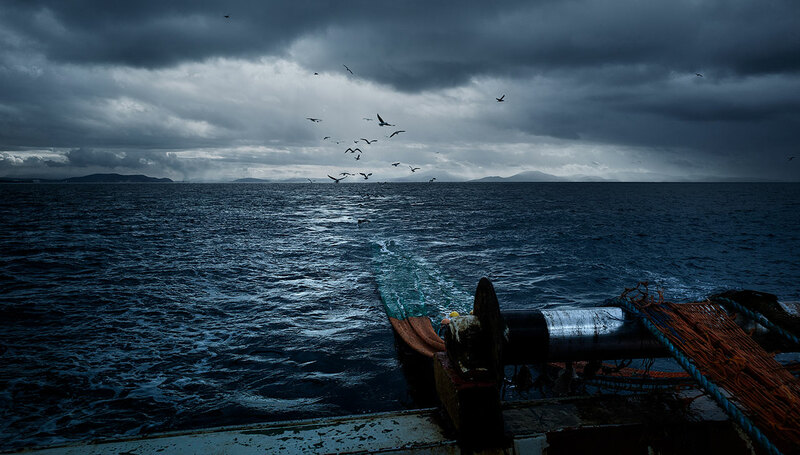 Accompanied by seagulls and humbled by the vastness of the temperamental waves, we mentally board the tight quarters of their fishing trawler and sail along with them out into the open Aegean Sea.